Venue: IDK 6, UTAR (Perak Campus), Kampar, Perak. Technopreneurship is not a product but a process of synthesis in engineering the future of a person, an organization, a nation and the world. In a digital, knowledge based society, strategic directions or decision making processes will be demanding and complex. This requires tertiary level and professional development programs and training to produce strategic thinkers who will have the skills to succeed in a dynamically changing global environment. Traditional educational programs, however,lack the methodology to transform today's students into creative,innovative, visionary global leaders who understand the importance of technopreneurship. - Sunway Integrated Outsourcing Sdn. Bhd. - Sunway Business Applications Sdn. Bhd. - Sunway E-Systems (Asia) Pte. Ltd.
- Sunway MSC Sdn. Bhd. - S&I Technologies (China) Co. Ltd.
Mr. Cheah has more than 20 years of experience across technology, business strategy, industry development and services globalization including policy development for various large regional conglomerates. 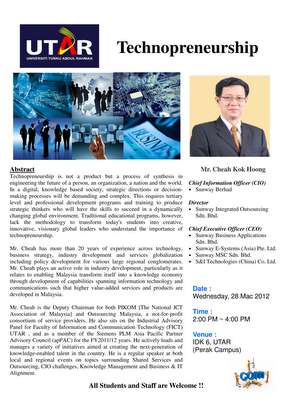 Mr. Cheah plays an active role in industry development, particularly as it relates to enabling Malaysia transform itself into a knowledge economy through development of capabilities spanning information technology and communications such that higher value-added services and products are developed in Malaysia. 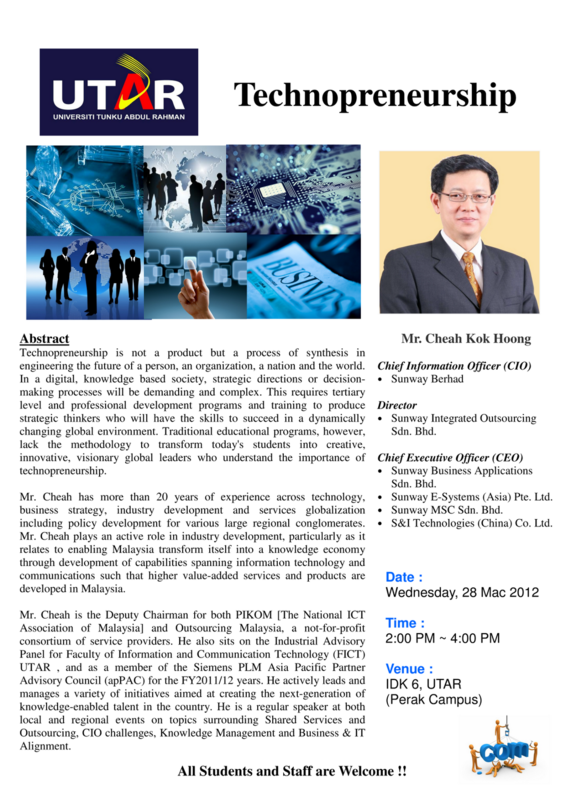 Mr. Cheah is the Deputy Chairman for both PIKOM [The National ICT Association of Malaysia] and Outsourcing Malaysia, a not-for-profit consortium of service providers. He also sits on the Industrial Advisory Panel for Faculty of Information and Communication Technology (FICT) UTAR , and as a member of the Siemens PLM Asia Pacific Partner Advisory Council (apPAC) for the FY2011/12 years. He actively leads and manages a variety of initiatives aimed at creating the next-generation of knowledge-enabled talent in the country. He is a regular speaker at both local and regional events on topics surrounding Shared Services and Outsourcing, CIO challenges, Knowledge Management and Business & IT Alignment.